With great devotion and enthusiasm devotees at Sivananda Ashram, A'bad, celebrated the birthday of their Beloved Swami Adhyatmanandaji Maharaj. As always, it was celebrated in a spiritual way with more Japa, Meditation and in the presence Holy Saints from May 1, 2007 to May 3, 2007. Each day began with group prayers in Brahmamuhurta (5.30am- 7.00am) Japa, candle light Tratak Kriya and Meditation in the ashram’s lawns, which followed a discourse by Revered Sri Dr. Swami Muktanandaji Maharaj of Alwar (Rajasthan) on the subject of Ashtang Yoga of Maharshi Patanjali. Also Maha Mrutyunjaya Mantra chanting was performed by devotees from 8-00 a.m. to 10-00 a.m.; 10-30 a.m. to 12 noon, 2-00 p.m. to 4-00 p.m. and 4-30 p.m. to 5-30 p.m. Devotees from all over Gujarat join in the celebration. On May 1, 2007 evening, Ms. Diptiben Desai's vocal music received a great applause. Sri Tushar Shukla, a director of All India Radio, A'bad was key person for directing and presenting the evening function. It was simply wonderful evening. On May 2, 2007 H. E. Governor of Gujarat Pandit Sri Nawal Kishore Sharmaji presided and graced the function held on Birthday Eve. It began with melodious devotional vocal music by globally known couple Smt. Vibhaben & Sri Rasbihari Desai and words of wisdom by Dr. Swami Muktanandaji Maharaj, Maha Mandleshwar Sri Dayananda Vedpathiji Maharaj and Revered Maa Kankeshwariji. In his speech H. E. Governor once again said, " Normally, I visit any institute once only, but it is not the same for Sivananda Ashram. I am very happy to say that this is my seventh visit in span of my two and half years of Gujarat Seva. The reason is that I come here to receive inspiration from Rev. Sri Swami Adhyatmanandaji Maharaj. Swamiji’s ever shining face and vibrant personality is a source of inspiration and enlightenment to countless devotees of this institute and all over. The thirteen days long festival would not have been possible without participation and enthusiasm of the devotees. It shows the love and devotion you all have for Swamiji..
Sharmaji further added that I am delighted to award worthy individuals for their commitment to selfless services.. The wonderful seva works done through Sivananda Ashram, Ahmedabad is possible because of such sincere souls, who are striving and struggling to do best to the mankind. As Ahmedabad cancer hospital comes under Gujarat governor's jurisdiction and I know personally Dr. Pankaj Shah and his commitment, dedication and devotion. I can understand that all the awardees of today’s function are of the same category. Swamiji! Please be sure! My visit to this institute does not need any formality, it requires only the occasion, just inform me and I will be with you all, whole heartedly, because all of you exist to serve the mankind, something Bharatmata would love and cherish, which I too love and appreciate." At night, there was a special program of devotional music by Dr. Monicaben Shah from 11-00 p.m. to 12-00am, which followed midnight meditation and a very special felicitation of Happy Birthday Greetings for beloved Swami Adhyatmanandji Maharaj. Sri Ramaben Hariyani gave a little speech on this occasion also.Prasad was distributed to a large number of devotees, who were present at that special hour of the holy night by the hands of Rev. Sri Swami Adhyatmanandaji Maharaj. May 3, 2007 commenced with Greetings and felicitation to Rev. Sri Swami Adhyatmanandaji Maharaj. Devotees together with Pujya Swamiji lead a procession chanting Harinam Sankirtan to Sri Vishwanath Temple. Aayushya Homam was performed for Rev. Sri Swamiji Maharaj's excellent health, long life and Sri Guru Krupa. After a special worship in the ashram temples and Holy Paduka Pooja (worship of sandals) of Sadgurudev Sri Swami Sivanandaji Maharaj and Gurubhagavan Sri Swami Chidanandaji Maharaj, a grand feast (Mahaprasad) was served to hundreds of devotees. On this special day about two hundred and fifty under privileged children of surrounding areas were fed Ladoo, Namkin, Fruits and Milk. Evening program commenced with devotional vocal music by Sri Nayan Pancholi. Blessings by Maha Mandleshwar Sri Dayananda Vedpathiji Maharaj, Sri Dr. Swami Muktanandaji Maharaj and cultural program by school children of Sri Narayan Guru Cultural mission. The highlight of the evening was offering of Sri Swami Adhyatmanandaji Maharaj for His Master Gurumaharaj Sri Swami Chidanandaji Maharaj. The words can’t express Swamiji’s love and gratitude for His Master. Rev. Swamiji said, " Anything good happening here is only Sri Guru Bhagavan Swami Chidanandaji Maharaj's Will, Blessings and Grace. Any honour given to Swami Adhyatmananda is actually honor to Rev. Sadgurudev Sri Swami Sivanandaji Maharaj and Guru Bhagavan Sri Swami Chidanandaji Maharaj. They dwell and exist in each brick and tree of this Ashram. That is not just my words but my experience at each moment of my life. Hence, when you all come to the ashram try to feel their holy presence and receive their Grace. Feel blessed that we all are born when they too are moving, existing on the earth planet." From May 6, 2007- May 10, 2007, ashram organized a children's residential camp. A systemic schedule was planned out for the Children to follow during the camp. The goal of the camp is to encourage the children to live disciplined life of virtues. Spiritual teachings were imparted through fun and games by qualified and experienced teachers. Activities like yogasana, meditation, japa, chanting, karate, music, painting, drama, folk dance are also incorporated in the curriculum. Children had a talent show at the end of the camp. It was indeed an enjoyable and unique experience for all the children who attended the camp. 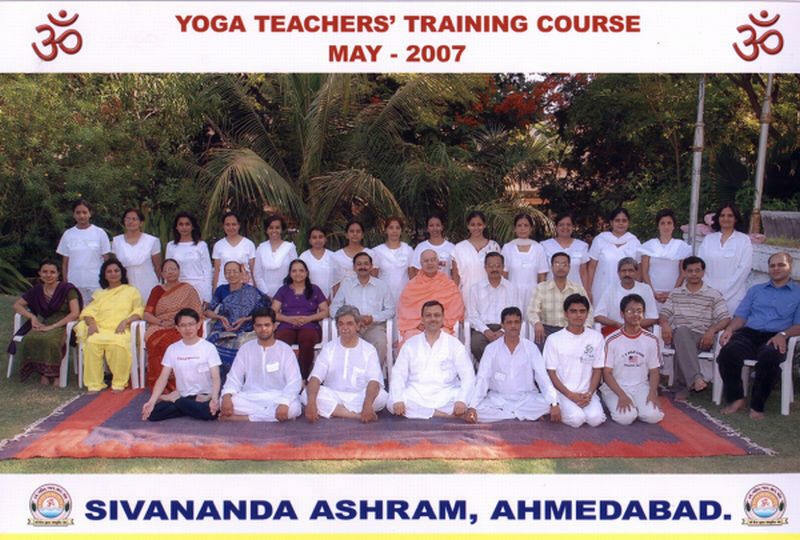 Twenty one advanced Yoga students attended and successfully completed YTTC, which was held through “SIVA Yoga Center” at Sivananda Ashram, Ahmedabad, under the guidance and leadership of Sri Swami Adhyatmanandji. The students came from all over India, Singapore and Brazil. Our team of Yoga Teachers including doctors and Yoga Vedant philosophy experts conducted the classes during the course. A concluding ceremony was held at Ashram's lawn and Shri Ashokbhai Bhatt, Hon. Minister of Health, Govt. of Gujarat presided over the function. Certificates were awarded to all participants for the Yoga Teachers Training Course on successful completion of the YTTC after written and practical exam. On May 20, 2007 holy anniversary of Sri Vishwanath Temple of the ashram was celebrated. Large number of devotees participated in Laghurudra Yajna. After early morning prayers and meditation Laghu Rudra Yajna was performed throughout the day. Eleven couples sponsored and performed special Yajna puja. At the conclusion of Yajna, Sri Swami Adhyatmanandaji Maharaj performed Bhasma Aarti and devotees were served dinner (Bhandara). A ten days long yoga teaching program was organized for 12 core army officials in response to request by Col. Ranjeet Singhji, commandant of 12 core Unit Shahibaug, (Ahmedabad). Sri Swami Adhyatmanandaji gave inaugural discourse on morning of May 23, 2007 and then yoga teaching was followed by Sri Atul Parikh, Joint Secretary of Ashram. He is in charge of yoga activities of the ashram. He was assisted by Sri Dhawal Patel and Professor Shalin of Gujarat University. 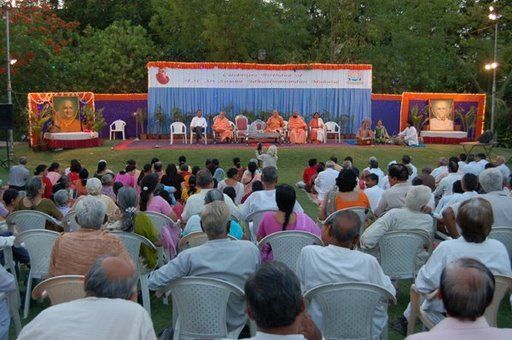 On May 2, 2007 Sri Swamiji Maharaj was invited to laid the foundation of Sri C. U. Shah Institute of Management Studies and Sri C. U. Shah Institute of Science and Technology at Wadhwan (Surendranagar). Twelve years ago, Sri Swami Adhyatmanandaji laid the foundation of college of commerce and computer studies here itself. It is run and managed by Sri Vardhaman Mahavir Education group. This institute is having 1500 students and having wonderful reputation of its education system as well as management. The group requested Sri Swamiji Maharaj to lay the foundation stones of both their institues by Sri Swamiji Maharaj. The Management promised for arranging blood donation camp upon opening of new session after summer vacation. On May 4, 2007 Sri Swamiji Maharaj was invited at inaugural ceremony of Sri Ram Mandir's community Hall at Kamana (Visnagar). On May 10, 2007 evening Rev. Sri Swamiji Maharaj was invited at Sargam Nartan School of Indian Classical Dance for their three student’s Arangetram. On May 17, 2007 a discourse by Sri Swami Adhyatmanandaji on the subject of “Health Excellency” was organized at famous Sports Club of Sardar Vallabhbhai Patel Stadium. It was attended and well received by elite group of people. On May 19, 2007 Rev. Swamiji Maharaj was invited to grace the fund raising event at Sri Vadnagara Nagar Mandal, (A’bad). Bank of Baroda's employer's union commenced its Golden Jubilee year from 27th May 2007. To mark this date, a gathering was held at ashram premises with courtesy of ashram authorities. H. E. Maharaj of Baroda Srimant Ranjitsinh Gaikwad, a Chairman of Bank of Baroda and founder of this union inaugurated the function in august presence of the chief guest Shri Ramanlal Vora, Hon. Minister for social justice and empowerment, Govt. of Gujarat, distinguished Guest Dr. Anil K. Khandelwal, a chairman and managing director of Bank of Baroda and Shri Milind Nadkarni, a General Secretary of National union of Bank of Baroda. Rev. Sri Swami Adhyatmanandaji Maharaj blessed the Golden Jubilee year celebration function. Over 1000 members attended the function. It began with Sahenai and Jaltarang by famous Gaikwad Brothers from Baroda, awards were presented and function concluded with grand dinner. On May 31, 2007 Rev. Sri Swamiji was invited to preside over two annual function of Nrutya Bharti of Kala Guru Ilakshiben Thakore and Sri Chandan Thakore. Please subscribe to Divyajivan Mailing List. We will update you with new uploads of spiritual literature on the web of Holy Master Sri Swami Sivanandaji Maharaj, saints of his lineage and other saints. We will also update you about the Sivananda Ashram, Ahmedabad website and facilitate communication with Sri Swami Adhyatmanandaji Maharaj. To manage your subscription, please visit Subscription Page. You can also subscribe and unsubscribe from this page. You may unsubscribe by yourself anytime you wish. You will be required to send confirmation link that you will get in your e-mail to complete this subscription.